"I actually asked him a couple of questions and his answers were very eye-opening," said Vega, who is from Portage, referring to topics Kojm addressed that many might not think of that impact the nation's well-being. "He stated many key factors dealing with agriculture, clean energy and international trade involving the nation's economy and its future. I was very honored to be able to meet someone of such prestige." In addition to speaking with students, Kojm also discussed some international affairs with faculty members who do research on various parts of the world, at times asking questions about current events in different countries. 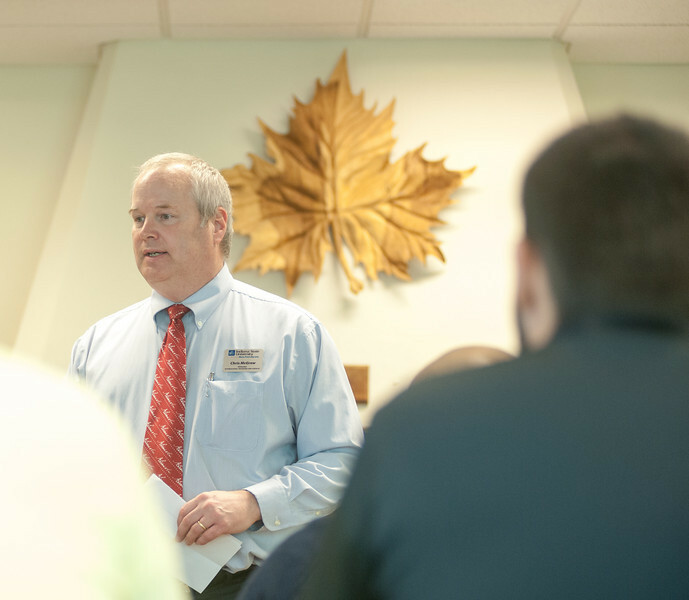 "Mr. Kojm's visit provided an opportunity for our students and faculty to see how what they're doing in the classroom relates to the world, and in particular U.S. foreign policy," said Chris McGrew, director of International Programs and Services at ISU. "Chris provided some great insights that engaged not only our students, but some of our faculty members as well." Kojm also received questions from students about careers in international affairs. "It's important to do these speaking engagements," Kojm said. "Ultimately the purpose is not just to inform, but to attract young people to careers in public service because we need people who are very talented." The students' questions and discussions impressed Kojm and Bassam Yousif, ISU associate professor of economics whose class was visited during one of Kojm's presentations. The National Intelligence Council chairman's visit to Indiana State came just weeks after former U.S. Rep. Lee Hamilton, who served as vice-chair of the 9/11 Commission, visited ISU in September to kick off the university's 2012-2013 Speaker Series. "It is great to have someone from outside ISU applying the knowledge that the students are learning to look at real-world issues," Yousif said of Kojm's visit. Kirk Owusu Moore, a sophomore legal studies major from Ghana, also enjoyed the insights Kojm shared during his visit, which extended beyond classroom lessons. "Being an international student, it helps give you perspective on how the world is moving around us," Moore said. "I think ISU should have these visits really often." It also was beneficial for students to get a better idea of the job opportunities that exist within the government, which exist in a variety of capacities, Yousif said. "I think what they will take away from the visit is there are interesting things going on," he added, "and that perhaps they want to be a part of it." Photo: http://isuphoto.smugmug.com/Events/Chris-Kjom-Visit/i-RXtWsmz/0/L/102512Chriskjomvisit-0083-L.jpg (ISU/Tony Campbell)Christopher A. Kojm, chairman of the National Intelligence Council, speaks to an Indiana State University class during a recent visit to ISU. 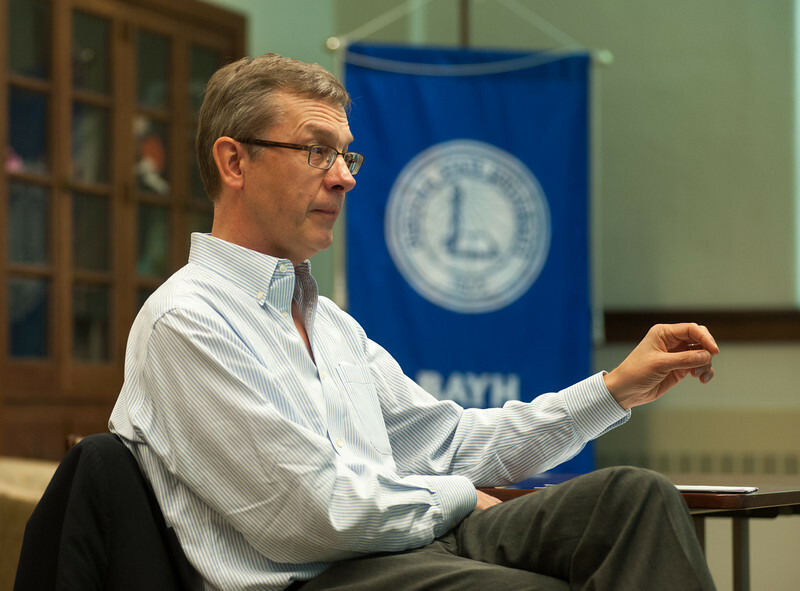 Kojm discussed a variety of topics with ISU students and faculty members during his visit. Photo: http://isuphoto.smugmug.com/Events/Chris-Kjom-Visit/i-BwwnQcJ/0/L/102512Chriskjomvisit-0046-L.jpg (ISU/Tony Campbell) Chris McGrew, director of the Office of International Programs and Services at Indiana State University, who helped organize Chris Kojm's recent visit to ISU. Christopher A. Kojm, the chairman of the National Intelligence Council, talked with students and professors during a recent visit to ISU.